With lots of amazing chatter in the quilting world around Quilts for Pulse, I wanted to do my part and design a fun heart block. 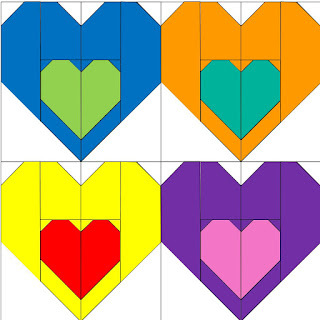 I decided to create a heart within a heart to show how we can be consumed by love and not hate. Download the pattern for free here! This block should compliment some of the other blocks that are being made for the Quilts for Pulse effort (hence the reason I made these 10" square). Here are four blocks together to show what they look like as a group. Each block finishes at 10" square and is paper pieced. 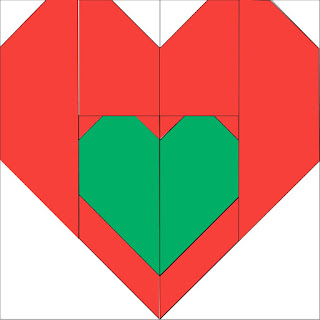 If you're not familiar with paper piecing, I recommend checking out this free tutorial. A special thank you to everyone making blocks and quilts for Orlando. As a Boston MQG member, I know how the quilting community can react during times of crisis and it is heartwarming to know how much we all care. Much love! Download the pattern for free here! What a wonderful design and great cause. I love it! Can't wait to try it out.